My daughter doesn’t have a Facebook account. She isn’t aware of how Twitter works and she knows that Whatsapp exists but only knows that we can send and receive messages and photographs via this medium. Of course, she is only 10. She turned 10 just last week, as a matter of fact and it was a matter of great joy and pride to see the baby I held in my arms now all grown up as a young lady making her way into the world of double digits. People have asked me in the past how much time she’s spent with gadgets and it’s a matter of personal pride that I’ve been able to say with confidence that it’s been hardly more than 2 hours in a week. You’d think that’s impossible given that we’re surrounded by gadgets today. In a household that has 3 family members there are at least 6 digital devices at any given time. But, it’s honestly just been a matter of choice where we were concerned. 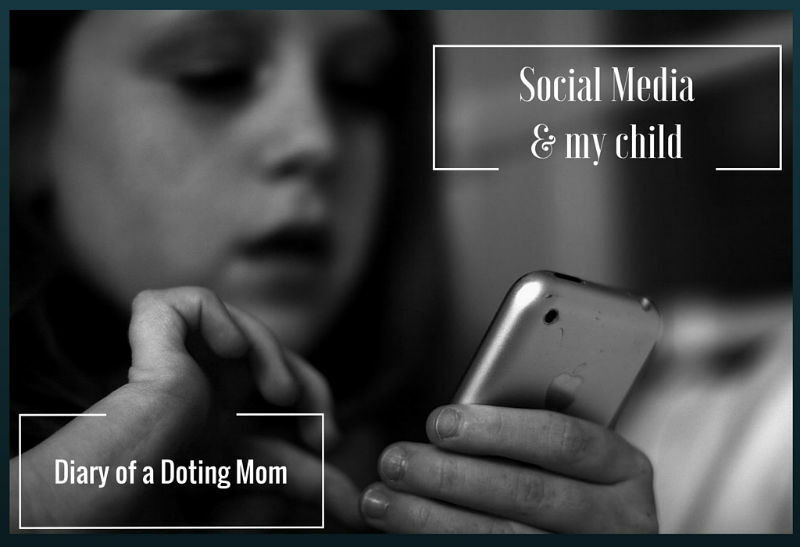 Social media, in my opinion, has two major influences on children today: one being the amount they themselves spend online and the other being the amount they are projected online via their parents’ updates and photographs. Friends of mine have wondered how I’ve limited the use of gadgets for Gy. The answer is pretty simple: I say ‘No’. I tell her that there are so many other things she can do: read, quill, play outdoors, chat with friends in person, go for a Nature walk, ride a bike, use a skateboard, clean up her room, organise a shelf in her wardrobe, paint, sketch, draw – you get the idea. Does this mean no gadgets at all? Not necessarily. The school has also recently incorporated some gadget use but it’s all educational so I set aside time for her each week to spend on learning apps as well as some sketching apps. Games? A few here and there are fine but I am a stickler for time and definitely do not allow more than 20-30 minutes at a stretch and just once during the week. To her credit, she’s been very conscious herself and switches off gadgets when I say so. I’ve heard parents say that it’s impossible to keep kids occupied and they especially find it challenging when they go outdoors for a meal or an evening out with friends. As much as it may kill you to hear this, let them get bored. Boredom is good for kids as it helps them unwind and also process the idea of doing nothing. Too much stimulation of the brain is also not ideal, as you’d have noticed. Gy received a Wi-Fi device this birthday from us which does not have a SIM card. She accesses Skype which we use to chat with her dad who’s away during the week and a couple of learning apps which help with her academics. That’s about it. Read: Is your kid smart enough for a smartphone? For the purposes of this post, I’m going to restrict myself to parental roles and assume that your kids are below the age of consent. Older kids and social media behaviour will have to make for a separate post. There’s a reason I use Gy when I refer to my daughter. It’s her identity online and one that I don’t want to mess around with, frankly. As she grows up her full name with her credentials will have to lead back to her and what she has done, not what I’ve done for her. I think I may have offended a few people recently when I gently messaged them to say that they use ‘Gy’ when referring to my daughter on Facebook, even if we are good friends offline. But I don’t mean to upset anyone; I merely request that you protect her privacy. Not all my friends on my Facebook list are people I have necessarily met in person and it pays to be wary. I’ve also spoken about the need for better privacy controls and settings when it comes to sharing pictures of your kids online. I get that you’re keen to share your joy with the world, believe me. But these are kids we’re talking about. Do not geo-tag photos of them or add any identifying marks such as the names of the schools/ places they visit. Try not to take photos which show their face completely or at least ensure that these are only shared with very close friends and family that you can trust. Use tastefully taken photos that you can use online without compromising on their identity. Do not use pictures of your kids in your social media profile photos or cover pictures. These are always public. If they are old enough, ask them before posting their pictures online. Trust me, it’s never too early to start asking. As parents and as bloggers, a lot of us have a responsibility towards two sets of people: our kids and our readers. How do we tread the line of propriety without over-stepping the bounds of embarrassment and/or security? We take precautions and we exercise our judgement as to what works for our family. I realise that will vary significantly with each parent and that’s fine. Just keep in mind that your child will grow up and will see themselves online in some form or another a few years from now. Putting yourself in their shoes each time you post an update or a picture today will go a long way towards striking that balance effectively. You have made an excellent argument with which I agree. I believe in balance in all aspects of life. A happy belated birthday to Gy, first of all… And you make a strong argument, Shailaja. At the end of the day, it is the safety and security of the child that we need to take care of, in whichever way we deem fit. And yes, I need to learn how to limit time with devices myself! I cannot let M become like me, it certainly would be good! And I cannot be a bad example to her! You've done a great job with Gy Shailaja. When I started blogging I wasn't cautious at all. However slowly I've learnt to be careful. The kids are allowed screen time – they are into gaming and they watch films on DVD too – only over the weekend. We don't have a cable connection so that's one less worry. We also allow them iPads during summer vacations. This works for us. They have no clue what FB is or twitter. N likes to use my phone for clicking pictures since she's fond of photography. I'm considering getting her a camera to keep my phone safe. I've often wondered how kids are managed with gadgets these days, they could just keep themselves busy with video games all day if they want to. My aunt has a strict rule for her kid to use the tab for only one hour. It's great that Gy doesn't spend much time over them. Nice that you shared these thoughts on privacy and social media. I haven't taken it up so seriously so far, and I realize that I must. I agree. Most of us may get carried away when sharing pictures of our kids. I have also learnt over the years and longer share pictures of them. Also about the social media time, yes that had to be restricted for children. It does not take much for them to lose control. Erring on the side of caution is definitely better here. I find this phenomenon really funny: people sharing videos of their kids doing cute or funny things on YouTube and other social media. I can only imagine what the lives of those kids will be like as they grow up, knowing they were the subject of one million likes, but not knowing exactly why they deserved that much social media fame. Very well put, Shailaja. There isn't much that I can add to it. Rishi does have some technology time – but yes, we limit it to a maximum, encouraging him to do other things, even if things do get messy at times. We all learn, Naba as we go along and you seem to be doing just fine so far. It's an ongoing process and since tech is here to stay it helps if we can align our goals accordingly. Thanks Rachna 🙂 I wish more parents took this seriously. I get a bit worried looking at so many kids' photos online. Honestly. Very well put, Mithila. Most often as parents we get carried away in sharing information and pictures and then have to live with those feelings of worry. Best is to nip it all in the bud. And don't worry, I got what you meant in that sentence. Thanks Sid! Yes it's best to start them off early on this routine so they realise it's par for the course as they grow older. I completely agree with your thoughts. Social media should be used judiciously and with caution. I have seen people posting even the most intimate pics on facebook. Very true, Swati. It scares me to be honest. That plus checking in when they are in a public location and broadcasting that on social media. Really wish people would think. Totally agree with everything you said, Shailu. I disapprove of children being tied to devices when they ought to be having a good time spending physical energy, in nature, with other people and discovering things, doing things with their hands, laughing loudly, drawing, etc. We did the same with Vidur. The only time he held our phones was when someone called and wanted to have a word with him – in fact, he considered it a treat to click a photo on the phone. No computer games, no phone timepass. Even when we went somewhere and had to wait, he carried a drawing book or a book to read. Why, he got his own first mobile only when he started college, and that too because it is in a different city. I feel nervous when I see people posting all kinds of photos that one ought to probably treasure in a private album – certainly not for the world to see, because who knows who is watching. Bad enough we hear about so many cyber crimes. I totally agree and not just for children but for us adults. It's easy to fall to the game and attraction of social media but it is equally important to see how much we expose ourselves to the many risks. My Kid is not old enough to understand my NO but I try my best to engage him with his toys, Books and other things in House rather than handing over my device to him, even if I am tired. It gives me a huge satisfaction. I wonder why parents create account on Facebook on name of their just born Kids and publish their pics. Agree with your thoughts Shailaja.. kids definitely need to be monitored on their access to gadgets and social media specifically. Science has also proved how bad it can be for young brains to be constantly exposed to gadgets.. I haven't reached this stage, yet, but will be here soon enough. As of now, there is a complete ban on hand-held video games. Too addictive. Agree with you completely. It's all about the choices we make. Limited gadget time is what I subscribe to. There are so many constructive activities to keep the kids engaged. Of course, they should know about the prevailing apps, games etc, but they should be using it in moderation. Balance is the key! Nice Points Shailaja Mam. I have 7 year old kid and she usually gives 1-2 hours daily in front of screen, it may be Computer/Smartphone/TV. And 90% time just for fun or time pass. In personal, I know, its not her fault, Whenever I am busy, I just allow her to use screen, so she don’t disturb me and I can finish my work soon. She can even play on phone whole day or can watch tv for hours. Again I know that’s not her fault, She is so young to think its side effects. I should give her more time and give her a right direction, so she do more creative things. We know many things but don’t work on it strongly. And sometimes, articles like this, open our eyes and help us to work on important ignored things. Thanks again for writing on this Mam. Happy birthday to the angel… and its so cool that she spends that little time on gadgets.. I have friend's whose kids spend lot more in the morning, and some more in the noon and evening… It is quite sad that many rely on gadgets to keep their kids engaged, silent, trouble free [as they call it] .. Kudos to you!! Lovely Post. I came to your blog to get to know you before sending you the questions. Seems like I am going away with more than I bargained for. Marking this blog for my future reads. Well said, Parul. If we can watch our actions we can go a long way towards helping ourselves too. I've never understood that either, Upasna. It worries me that a kid has a Facebook account, even if it is managed by his/her parents. Sigh. You and I know it, Asha. I hope other parents realise it too. I'm with you on that one. Cannot bear the addiction of gadgets and their effect on kids. They have forgotten basic social skills, I tell you! Very true. I wonder when this craze for gadgets and apps overtook the next generation to the extent that we even have to write these sort of posts. At one level, it's frankly scary. You're welcome, Seema and I hope this helps you on your parenting journey. Thank you Aarti! I know. I think most parents don't think about the necessity to curtail gadgets. I'm pretty old-fashioned that way, I guess.